Between Meals: Drink 1/2 - 1 serving of Serious Mass between meals to maintain positive nitrogen balance and support a high-calorie diet. Before Bed: Drink 1/2 - 1 serving of Serious Mass about 45-60 minutes before bed to provide nutrients to recovering muscle throughout the night. 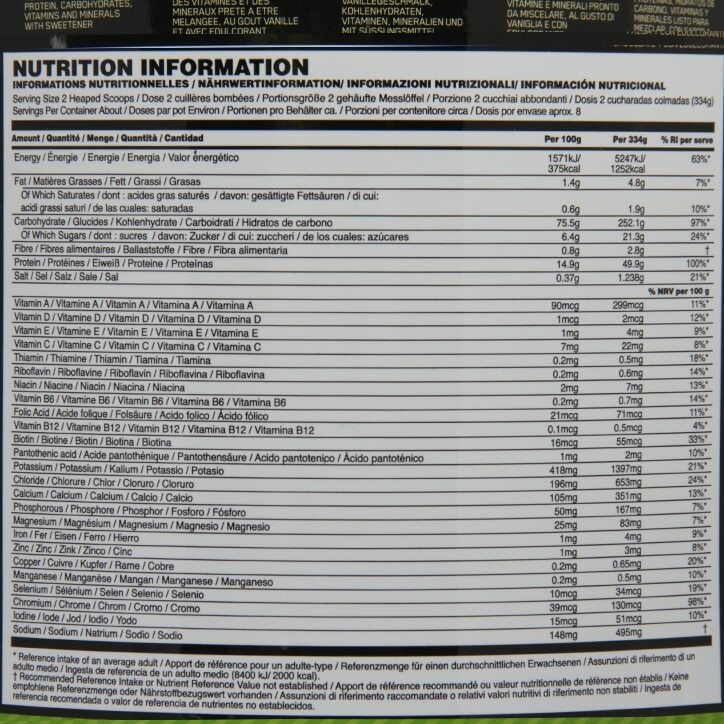 Maltodextrin, Protein Blend (Whey Protein (Milk) Concentrate, Calcium Caseinate (Milk), Egg Albumen), Fat-Reduced Cocoa Powder, Natural and Artificial Flavours, Mineral Blend (di-Potassium Phosphate, Sodium Chloride, Ferric Pyrophosphate, Zinc Oxide, Copper Gluconate, Manganese Sulphate, Chromium Chloride Hexahydrate, Potassium Iodide), Medium Chain Tri-Glycerides, Vitamin Blend (Dextrose Monohydrate, Ascorbic Acid, Vitamin E Acetate, Niacinamide, Biotin, Vitamin A Acetate, D-Calcium Pantothenate, PyridoxineHydrochloride, Folic Acid, Cholecalciferol, Thiamine Hydrochloride, Riboflavin, Cobalamin), Sucralose. Contains Milk, Soy, Egg, Wheat (Gluten). 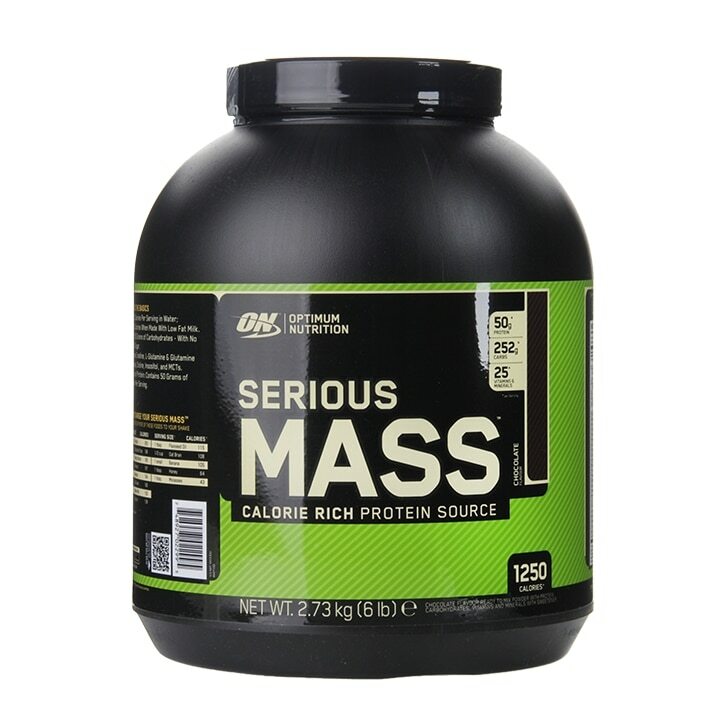 Optimum Nutrition Serious Mass Chocolate Powder is rated 4.5 out of 5 by 70. Rated 2 out of 5 by Ambrose from Good product I have been using this product for over a year now and I always come back to it. Have tried other products but non delivered as much as serious mass but my favourite flavour is vanilla. Rated 5 out of 5 by Rio louise from Great product I started taking this (2 servings a day) to gain weight. I am a 28 year old woman at 7st 10 and always have been this skinny. I want to put weight on so thought id try this. Although i only tuck it for 6 days due to having bad headaches. I think id have deffinitely seen good results if carried on with it. Not sure if that headaches where because of this but tjought it was best to stop...(no more headaches).